Dongguan Green TPU Co., Ltd. 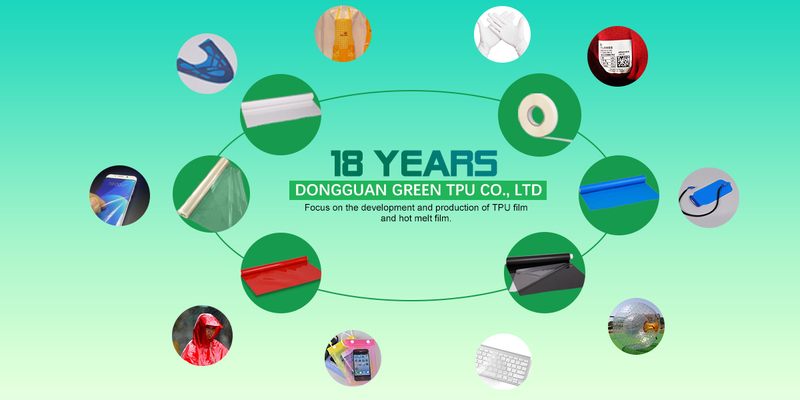 Established in 1997, Dongguan Green TPU Co., Ltd is a TPU manufacturer with advanced equipment and strong technical force which is professionally engaged in the research, development, production, processing and sales of TPU thin film, TPU hot melt adhesive membrane and special TPU composite material, washing mark processing product. Our green TPU (Polyester and Polyether) series products bring no air pollution problems when they are burned, and can be decomposed by microorganism in 3-5 years time, so TPU series products will be the tide to substitute PVC film. Our TPU film with thickness of 0.015mm -- 2.0mm, width can be reached 1530mm, they are suitable for environmental protection materials and widely used in shoe material, clothing, bra strap, handbag, placemat, water walking ball, medical instruments, automobiles, sport products and other inflatable products. established in 1997, covering areas of 15000 square meter ,We have a complete set of advanced production line. With postive energy, environmental protection concept and outstanding product quality, we have stand firmly in the domestic and overseas market. Established in 1997, Dongguan Green TPU Co., Ltd is a TPU manufacturer with advanced equipment and strong technical force which is professionally engaged in the research, development, production, processing and sales of TPU thin film, TPU hot melt adhesive membrane and special TPU composite material, washing mark processing product. These products can be used in shoe and hat, tailoring, luggage, advertising and automotive. Our TPU film with many advantages, including non-toxin, tear resistance, good elasticity, remarkable abrasion resistance, excellent durability, outstanding tensile strength, easy for precessing, suitable for adhesion with cloth or other material, bending resistance, high temperature resistance, excellent flexibility at low temperature, anti-oxidation, waterproof & breathable, antifungal and antibacterial, antistatic and etc. Our TPU film has several series as below. 2. Low, middle, and high waterproof and breathable TPU film series. 3. Flocking TPU film series. 5. 2D, 3D illusion-colour TPU film series. 6. Reflective light TPU film series. 7. Plating TPU film series. 8. TPU waterproof strap series. 9. TPU waterproof zipper series. 10. High temperature resistance TPU film series. Our products are widely recognized and trusted by users and can meet continuously changing economic and social needs. Selling well in all cities and provinces around China, our products are also exported to countries and regions, such as America (both North America and South America), Europe, East Asia and Southeast Asia. Whether selecting a current product from our catalog or seeking engineering assistance for your application, welcome new and old customers from all walks of life to contact our customer service center about your sourcing requirements, welcome to visit our factory.